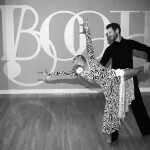 Booth Dancesport is proud to announce a new competitive training Bootcamp, Monday nights from April 1 through May 13 at The Savoy at Curtis Park. Start your evening with LaBlast Dance Fitness at 7:30 p.m. followed by Competitive Edge at 8:20 p.m. Pre-registration is required for the series and space is limited. Get ready to sweat! This class is for the serious competitor preparing for your next comp. Technical and mechanical focus will be a primary focus, along with drills and practice sequences. Maximize your pre-comp training for just $330! Call the studio at 303-412-7712 for register, talk with your instructor, or stop by the front desk. This entry was posted in Dance Lessons, Group Lesson, News. Bookmark the permalink.